Well that was the worst sports weekend I have had in a long time, all of my teams lost. I’m glad I turned off the World Series game Friday when I did. It was heading to the 9th and looked like extra innings… who knew? Nashville was annoying- only because the new equipment I was installing could not be completed because of poor planning on Nationals part. A long story which I won’t go into. And the drive up and back, which is normally very nice, was fairly rain soaked and foggy in both directions. Yesterday, no exercise, but some bush hogging and land clearing. Got a couple nice size piles ready to light!! FIRE! And looky there! My name and email has been saved. Nice work Paulie. Oh very nice on getting the plug-in installed! Yesterday I finally found the other 2/3 of the Westside Beltine that has been eluding me. Ridiculously poor signage, and also ridiculously poor trail access directions on the Beltline web site. But I have prevailed. The section that I’ve been missing out on is much more interesting than the one I knew how to find. I was intrigued by the number of houses in that part of town that now back-up to the Beltline. Also I’ve seen pictures of the first mural on this page: https://suzyschultz.net/murals/# and finally got to see it in person. I rode both Beltlines, and the Eastside trail was borderline impassable. Apart from that I had a nice and much needed two-hour ride. Stacy! Welcome back! I was asking about you last week. Thanks for the tip about the Ashby Station. When I’m riding solo it’s a surprisingly quick jaunt across Grant Park down Georgia Avenue which turns into Ralph David Abernathy. I turn left on Murphy Street, and then I can ride on the sidewalk for a couple of blocks to catch the Beltline entrance behind Monday Night. Or take my life into my own hands on 6 lane wide Lee Street. I prefer the sidewalk there. I was happy to stumble across Lean Drafthouse (Oh! That’s where it is). Ashby Station will be an option when I get others to ride the Westside Beltline with me. When I’m on my own on the way back I turn left on Hank Aaron which turns into Piedmont. I take that north to 10th Street, pick up the bike lane by Piedmont Park, and then catch the Eastside Beltline back to Cabbagetown. And I completely agree, I love having a completely different relationship with my city when I get out in it without a car. Oooh, that looks awesome, that Proctor Creek Pkwy! Luck to you (not that you’ll need it) and thanks for the tip! I might have to get out and explore that sometime too. Hank Aaron turns into Piedmont; well I’ll be darned. I never knew that before. Georgia Avenue doesn’t have a bike lane, but doesn’t really need one (yet). Ralph David Abernathy has a bike lane, as does Murphy Ave. There are some serious hills between Grant Park and the Westside Beltline, but it’s been some useful strength training me the few times I’ve ridden it. Oh, nice, Paulie, something you did now says when a comment is awaiting moderation. Nice work on upgrading the blog! Moderated comment had a different email address than the one you normally use. Yeah, field partially autocompleted incorrectly and I didn’t clear it. Nice to have this stuff get remembered now. Oh, and if you want to see something really fun? Go look at Google Maps at what your mural looks like on there. 🙂 (well, this stuff is really fun for geeks like me!) I love that you can tell by the date how long ago it was though; 5 years in this case. And yes, like Steve, my mileage is seemingly varying on the GPDR checkbox. Not complaining, just reporting my experience. It appears that it’s necessary to click the checkbox every single time, otherwise it forgets. Voted this morning, first day this polling place was open so I am not surprised that they had problems. Went to treat myself to vegan sweets at Dolce in Kirkwood only to find that they are closed Mondays and Tuesdays. I wasn’t hungry enough for Majestic so I came into the office to have some avocado biscuits I had packed and apparently have beaten all of new “XYZ Corp” execs into the office. Even though Glory Mole and I didn’t come in on trail (long story) we weren’t DFL. I was somewhat disappointed with the lack of costumes in circle. Paulie: somewhat related, today is (would have been) Bob Ross’s birthday! 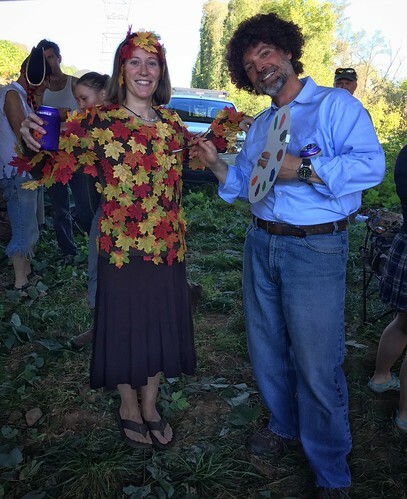 But are there happy little trees? I assume you mean field autofill (name, email, etc)? Can’t help you there. BTW I have neither the php coding chops, nor time and desire to obtain them in order to fix this any further. Oh, that’s fun! Well played! Must… fight… urge to.. make snide…. remark!